MIT Press (MA), 9780262016698, 211pp. America's once-vibrant small-to-midsize cities -- Syracuse, Worcester, Akron, Flint, Rockford, and others -- increasingly resemble urban wastelands. Gutted by deindustrialization, outsourcing, and middle-class flight, disproportionately devastated by metro freeway systems that laid waste to the urban fabric and displaced the working poor, small industrial cities seem to be part of America's past, not its future. 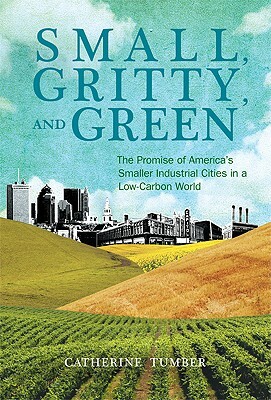 And yet, Catherine Tumber argues in this provocative book, America's gritty Rust Belt cities could play a central role in a greener, low-carbon, relocalized future. Tumber traveled to twenty-five cities in the Northeast and Midwest -- from Buffalo to Peoria to Detroit to Rochester -- interviewing planners, city officials, and activists, and weaving their stories into this exploration of small-scale urbanism. Smaller cities can be a critical part of a sustainable future and a productive green economy. "Small, Gritty, and Green "will help us develop the moral and political imagination we need to realize this. Catherine Tumber, a journalist and historian, is the author of American Feminism and the Birth of New Age Spirituality: Searching for the Higher Self, 1875--1915. She is a Research Affiliate in the Community Innovators Lab in MIT's Department of Urban Studies and Planning.